2008 first experience with Clay… loved it… fortunate to meet and have a series of seminars with some talented people who became my teachers. Like Antigoni Pantazi, Marilena Michopoulou, Menandos Papadopoulos, Kiki Gerontakis, Antonis Loutsis. Clay… is my way of communicating with myself, and therefore with others. By exploring this material, I sense the possibility to express myself through understanding of nature’s secrets, respecting her rules and limitations. 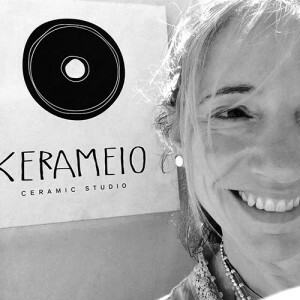 In KERAMEIO Workshop I develop an ongoing research into the field of ceramics, personalizing work techniques, exploring color schemes. Ceramics are a way to be present in the “here and now”. Every piece you create is unique. It changes over time, it ages, it feels human. So every time I open a fired kiln I keep feeling a mixture of worry and excitement. Generally speaking, my work explores the layered landscapes and sea-washed coasts of Serifos, so all of my hand-made stoneware pieces are characterized by curved lines and simple forms.